The London Dungeon is now bigger and better after moving to a new site by the Coca-Cola London Eye! 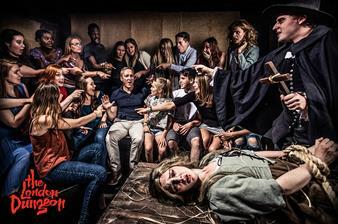 Bringing 1000 years of unsavoury London history to life, The London Dungeon is an attraction packed full of lively real-life actors, vibrant sets and special effects! Mark the 350th anniversary of The Great Fire of London from 21st May onwards with a brand new multi-sensory experience. The streets sizzle and dance with flames, cooked pigeons fall from the sky and St Paul’s burns to the ground. Guests will need their wits about them to escape un-singed! End your terrifying experience in the Dungeon with a drink at the vibrant, decadent and dodgy Victorian pub, The Tavern. Patrons will feel, smell, see and hear the drama around them in this 360 degree themed set – no tables will have the same experience! An alcoholic (over 18s only) or non-alcoholic drink is included, and guests can stay as long as they like!